Simple pulse schemes are presented for the measurement of methyl 13C and 1H CSA values from 1H–13C dipole/13C CSA and 1H–13C dipole/1H CSA cross-correlated relaxation. 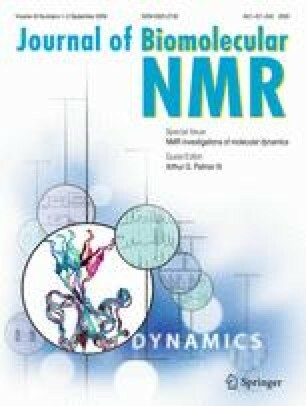 The methodology is applied to protein L and malate synthase G. Average 13C CSA values are considerably smaller for Ile than Leu/Val (17 vs 25 ppm) and are in good agreement with previous solid state NMR studies of powders of amino acids and dipeptides and in reasonable agreement with quantum-chemical DFT calculations of methyl carbon CSA values in peptide fragments. Small averaged 1H CSA values on the order of 1 ppm are measured, consistent with a solid state NMR determination of the methyl group 1H CSA in dimethylmalonic acid.